LAD is a wire harness assembly line developed according to the start-stop principle for the assembly trays throughout the several working areas. Trays slide on tubular rails in two movement platforms: the higher working platform and the lower tray return platform. This wire harness assembly line is preferably used for large wiring, where there is a need for several trays for single cabling. The identification of the different functions, through the use of LEDs and adjustments trays, gives great flexibility of assembly. The Flat Line also has a web platform for monitoring and production management. 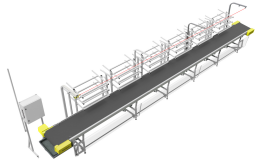 Overhang is a Wire Harness Assembly Line created according to the start-stop movement of the assembly trays throughout the several working areas. 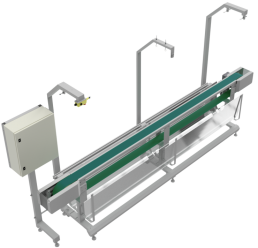 The tray is suspended in and slides along an electrified rail (EMS – Electrified Monorail System) working has a overhead conveyor. Several platforms may be placed along this line, in different levels, allowing perfect working area ergonomics. Tray placement and positioning allows working on both sides, therefore ensuring higher assembly process flexibility and a higher line reference diversity. The EQ line was designed based on the start-stop principle. 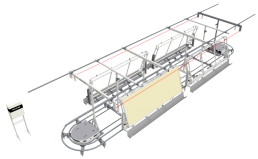 Product assembly is made by moving between working areas via a conveying canvas. This line offers great benefits from the ergonomic point of view as it allows the front-loading of components by operators. In addition, and because area supply is made in the line’s posterior region, this equipment increases factory layout improvement. A Rotary Line is a wire harness assembly a line formed by a dynamic carousel-like structure. Trays move the wire harness assembly boards in a controlled way throughout the line and working areas. Narrow is a line developed for the movement of products for assembly between working areas, via a conveying canvas. 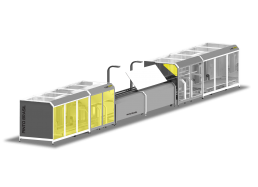 This is the ideal solution for the assembly of small components, ensuring high productivity rates. All components used by the operators are laid out frontally, making this equipment really comfortable from the ergonomic point of view.